Founded in 1998, the Eastside Arts Coalition is more than 60 Eastside arts groups and individual artists who have joined forces to promote performing, visual, literary and media arts and heritage in communities in East King County (Washington state, USA). Membership of the Eastside Arts Coalition is open to individuals and groups that create, exhibit, support, teach, present or produce culture on the Eastside, including music, dance, theatre, visual, literary, heritage, film and multi-media arts. Our members cover all sizes and types of groups, including non-profit organizations, governmental entities such as arts commissions, and for-profit corporations, all sharing a common aim of enhancing the vitality of arts and culture on the Eastside. Our mission is to enhance the vitality of the Eastside by bringing the arts and cultural community together, building community awareness, support and involvement, and promoting partnerships and joint programs that maximize the resources available to Eastside artists and arts and cultural organizations. Our members meet on the fourth Tuesday of the month, usually in the morning. Meetings are hosted by our member organizations, and we change the meeting location regularly. We are seeking meeting locations for 2012 and would welcome offers to host from our members (requires space, tables and chairs for about 20-30 people, we provide a contribution towards refreshments). 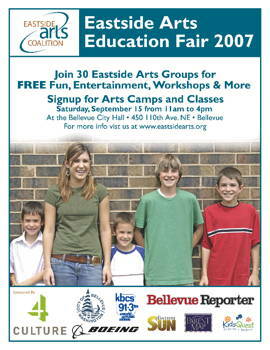 On September 15 2007, we organized the first Eastside Arts Education Fair – a collection of information, performances, workshops and activities highlighting the arts and educational services and opportunities the Eastside has to offer to the community. 30 artists and groups took part in the event at Bellevue City Hall. View the poster large scale. We held a second Fair in April 2008, and this time moved the event to Crossroads of Bellevue, which encouraged more people to stop by the tables of the organizations that were represented. The Fair took place on the same day as the Bite of Crossroads. Our third Fair, on April 25 2009, again at Crossroads, was our most successful yet – more details here. The first Eastside Arts Alive! Festival was held in 2004 and included about 20 member organizations performing concurrently at two venues, the Theatre at Meydenbauer Center and Kirkland Performance Center, over three days. You may download the Executive Summary as a PDF file to read and/or print off-line.